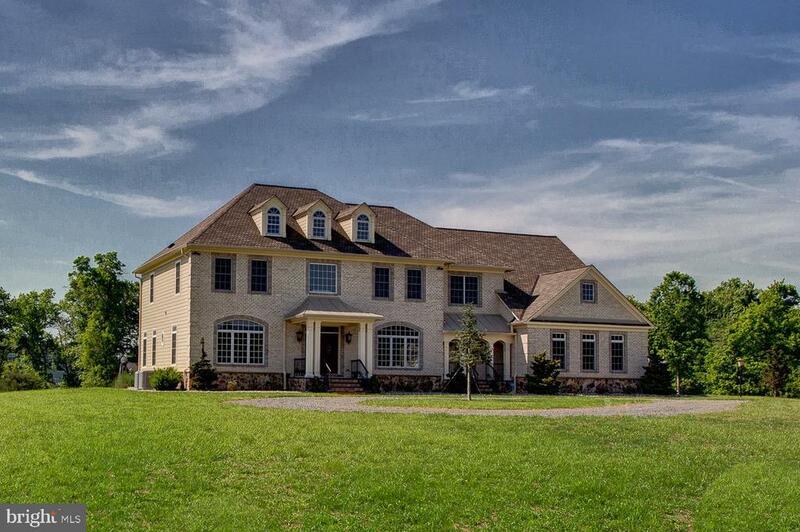 Rare opportunity to own one of a kind estate home located on a serene 10 acre lot. This home was custom designed and crafted with attention to detail as the top priority. Finishing details include antique reclaimed American oak and pine flooring throughout upper two levels. Marble tile in foyer. Extensive moldings and custom carpentry in every room. Black wrought iron vent covers. No detail has been overlooked. Gourmet chefs kitchen details include: oversized island with gas cooktop and bar height seating at end, custom cabinetry, matte granite countertops, recessed and pendant lighting, walk in pantry, wall oven and microwave, built-in desk. Large windows allow abundant natural light and sweeping views of property. Informal dining/ breakfast room adjacent to kitchen offers access to property through large patio doors which walk out to brick patio and brick fire pit. Main level great room features wood burning fireplace with stone surround, columns and moldings, flat screen TV mount and built in ceiling speakers. Elegant formal dining room with butler~s pantry. Office/ library has been designed to maximize natural light and features built in custom cabinetry and glass French doors. Owners suite with two sided gas fireplace, coffered ceiling, two sitting rooms, and two large walk in closets. Master bath with heated marble flooring, walk in shower, bench, and body sprayers. Separate vanities. Soaking tub and water closet. Second upper level bedroom with walk in closet and private bath. Third and fourth bedrooms with walk in closets and Jack and Jill bath. Bright upper level laundry room with built in custom cabinets and laundry sink. Exterior of this home has been finished using HardiPlank fiber cement siding, stone and brick. Roofing shingles are GAF Country Mansion with a limited lifetime warranty. Mud room with full bathroom is accessed through front service entrance and garage. Oversized 3 car garage with 8 doors and outside door entrance. Built in cabinetry and sink. Workbenches and 220V wiring available for future use. Ample space for workshop or storage area. Lower level with wood burning fireplace has been roughed in and framed for three rooms plus bath. Building plans are available. Would be ideal for in-law or au pair suite. Dual zone Carrier HVAC system with 2 Ultra Violet air cleaners and humidifier. Gas hot water heater. Home has been pre-wired for a backup generator. Much of interior lighting fixtures are on dimmer switches or occupancy sensing switches. All bedrooms and great room have been cable pre-wired. See attached floorplans and 3-D Matterport Tour.